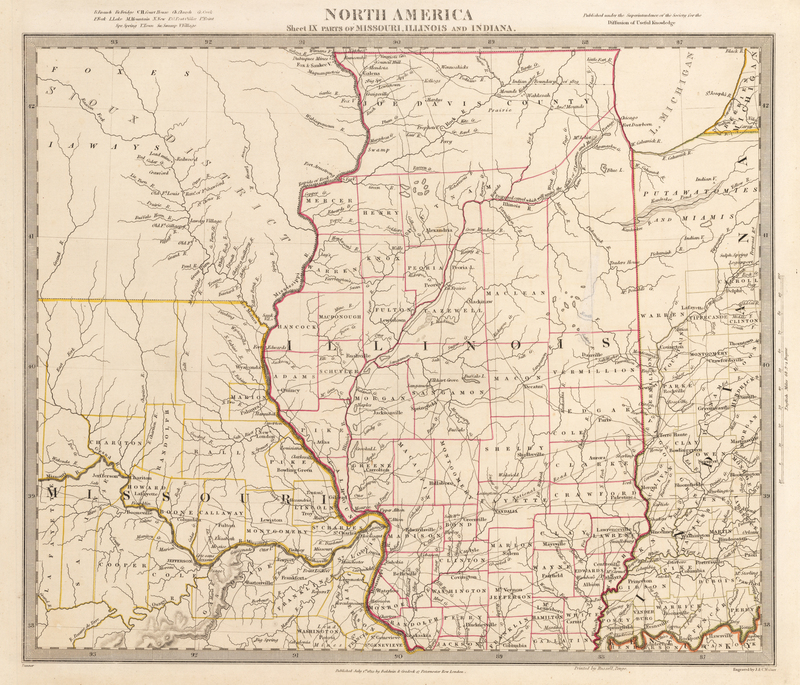 This marvelous regional map of Missouri, Illinois and Indiana shows the region and its early configurations including counties, towns, thoroughfares and Indian territories. The map is based on work by Henry Schenk Tanner, whose name is found on the map. Northern Illinois is sparsely populated, with one county covering the entire breadth of the state. Both Chicago and Fort Dearborn are on the map, and though the city had been founded just a decade before this map was published, it already had a population of about 8,000. The proposed canal from Chicago to the Illinois River is shown. The northern counties of Missouri are unnamed and northern Indiana shows the massive Putawatomies and Miamis Reserve. The Sioux District covers a large region north of Missouri and west of the Mississippi. An information key notes abbreviations for bridges, court houses, churches, creeks, forks, lakes, mountains, post offices, springs, swamps, Indian villages, forts, etc. River systems are depicted in some detail. Condition: This map with outline coloring is in A condition.